A hematoma is a localized mass of blood that is confined within an organ or tissue. A hematoma is sometimes referred to as a "blood blister." The most common type of hematoma in the dog is that affecting the pinna or ear flap. This is called an aural or ear hematoma. Why do aural hematomas occur? 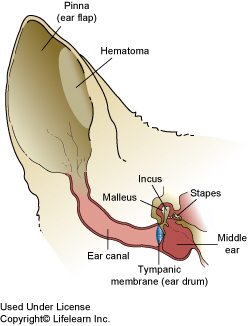 Ear hematomas occur when a blood vessel in the ear bursts and bleeds into the space between the ear cartilage and skin. This is most commonly associated with trauma such as scratching or shaking the ears and bite wounds. Dogs with ear infections may violently shake their head or scratch their ears causing an aural hematoma. . In some cases, there may be a piece of foreign material lodged in the ear canal such as a tick, piece of grass, etc. It is also possible that a foreign body initiated the shaking but was later dislodged. Dogs with long, floppy ears are at greater risk for developing ear hematomas. Pets with clotting or bleeding disorders may also develop hematomas, with or without a history of trauma. How is a hematoma treated? "The hematoma must be treated as soon as possible or permanent disfigurement may result." As well as treating the hematoma, it is important to treat the underlying cause. The hematoma must be treated as soon as possible or permanent disfigurement may result. The preferred method of treatment involves surgical correction of the hematoma. The actual surgical technique varies with the individual circumstances and veterinarian's preference, but always involves the same basic steps. First, the skin over the hematoma is surgically incised to drain the blood and remove any blood clots. Next, the empty space (called "dead space") is obliterated by placing numerous sutures through the ear, which will promote controlled scar tissue formation, reattaching the cartilage to the skin and helping prevent future recurrence. A surgical drain may be placed to promote drainage. 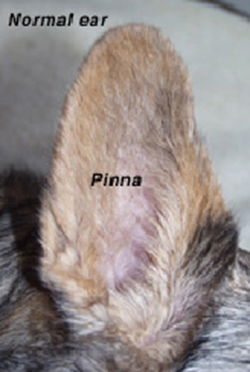 Finally, the pinna is supported to minimize further damage and promote healing. It may be supported by a bandage or other material applied directly to the ear, or by bandaging the ear against the head. Once the hematoma has been surgically corrected, if an underlying cause of the ear problem is found, such as an infection, an allergy, or a foreign body, it will be treated. What follow-up treatment is needed? Drainage tubes or bandages may be removed by your veterinarian after three to fourteen days. In some cases, there may be one or more drainage holes from the drain or incision, which will be left to heal by scar tissue. The sutures may be removed after 2 weeks if the ear is completely healed; in severe cases, some or all of the sutures may be left in place for up to two weeks longer. If discharge occurs from the surgery sites before they close, it should be cleaned off with mild cleansing soap. If an infection was present, it will be necessary to recheck the ear canal to be sure that the infection is gone. Otherwise, another hematoma may occur. If it is a blood blister, won't it disappear with time, just like a bruise? If left untreated, the hematoma may be slowly reabsorbed, but the associated inflammation damages the surrounding ear tissues and resulting in a distorted, cauliflower-shaped ear. Aural hematomas are very painful, and for humane reasons they should be treated. Can you just drain the swelling? Drainage may result in a temporary correction, but the hematoma returns within one to two days in the vast majority of cases. The longer the hematoma is left untreated the greater the likelihood of permanent damage and disfigurement. Drainage may be used if the hematoma is very small, or if the patient cannot undergo surgery for some reason. Anti-inflammatory medication is usually prescribed in these cases. The success rate is less than 50%.